All eyes are on Tropical Storm Hermine as the D.C. area prepares for Labor Day weekend. 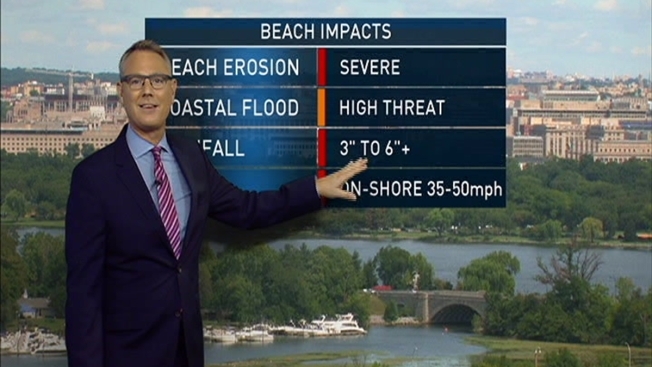 But if you've got plans to head to the beach, you should reconsider. The latest track continues to have only minor impacts from the storm here in the D.C. area, but major impacts are likely at the region's beaches. Storm Team 4 Meteorologist Amelia Draper said Hermine is moving up the East Coast and will bring between 4 and 10+inches of rain to parts of the Carolinas, as well as strong winds. It will then pass over the Outer Banks and into the Atlantic from Saturday night into Sunday. As it heads into the warm ocean waters off of the Mid-Atlantic states, it will strengthen again, with hurricane force winds likely Monday morning. The University of Maryland football team will host Howard University in the Terps' home opener on Saturday at noon. Some light rain can't be ruled out, so pack the poncho just in case. Otherwise, skies will be mostly cloudy with a breezy and temperatures in the 70s. The D.C. Blues Festival is scheduled to run from noon to 7:30 p.m. Saturday at D.C.'s Carter Barron Amphitheatre. Again, some showers are possible here in the D.C. metro area Saturday at times; otherwise, you'll have plenty of clouds and comfortable temperatures to make for a pretty nice day. Ocean City's special Labor Day Weekend beach fireworks are scheduled for Saturday at 9 p.m. With showers likely -- and the possibility of storms and howling winds -- you shouldn't be surprised if the fireworks end up getting cancelled, Storm Team 4 said. On the West Lawn of the U.S. Capitol, the Labor Day annual concert is set to start at 8 p.m. Sunday. Apart from some wind, the forecast looks good, with temperatures around 70. If the forecast changes and inclement weather emerges, the concert will be moved to the Kennedy Center Concert Hall, according to the Kennedy Center website. An early Monday shower is possible in the D.C. area; however, most of the day will be dry, with increasing sun, and breezy due to Hermine still churning offshore. The weather should fair well for the Herndon, Gaithersburg and Kensington Labor Day parades and festivals.